In a British censorship manual from WW2 two pictures containing hidden messages are displayed. Many have tried to find these messages, but up until now with no success. 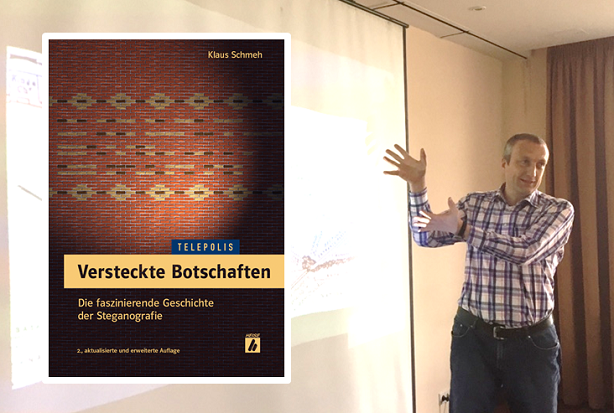 Last Friday I gave a presentation about steganography at the annual meeting of the high IQ society Mensa. For 90 minutes I talked about null ciphers, acrostics, semagrams, and other kinds of hidden messages. Most of the material was taken from my the second edition of my book Versteckte Borschaften, which will be published in a few weeks. In my talk I mentioned the two most important unsolved steganographic mysteries I know. Both are contained in a British censorship manual from World War II. A scan of this manual, which is kept by the British National Archives (KV-2-2424), is available here for download. It’s a fascinating read. I have blogged about it a few times before. Comments from my readers helped me to better understand the examples given in the manual and to learn more about the background. As can be read below the picture, the hidden message has two parts. The first one is (in English): “Heavy reinforcements for the enemy expected hourly”. The German original reads as follows: “Massive Feindverstärkungen werden stündlich erwartet”. This message is encoded in morse code. The dots and lines are somehow hidden in the three ladies on the top. 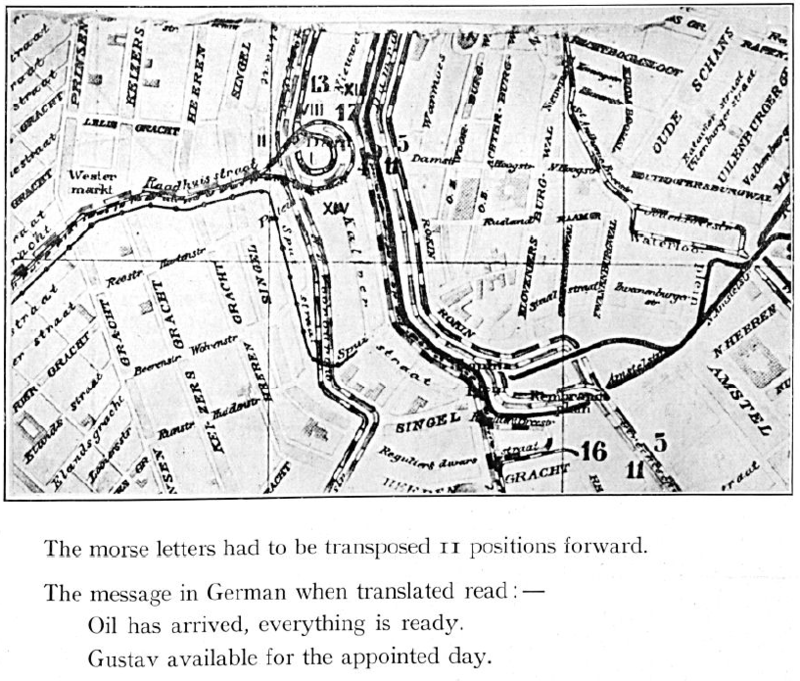 The second part of the message is (in English): “Before Arras.” According to the manual, it is contained in the signature – written in a French shorthand. The German original is not mentioned, but only “Vor Arras” makes sense to me. Arras is a town in Northern France. So far, I could neither find the morse message nor the shorthand message. I even went to the British Archive in London to look at the original document and to take high resolution photographs (like the following one). It didn’t help. This map represents the second mystery. Again, the message is coded in the morse alphabet (plus a transposition of 11 positions forward), which means that some elements on the map stand for dots and some others for lines. So far, nobody has identified these elements. As mentioned, I have blogged about these two hidden messages several times. I wrote about them in the first edition of my book Versteckte Botschaften. I reported on them in several peresentations. Many tried to find the solution, but to no avail. If you have an idea how these messages are coded, I would be very interested to learn. 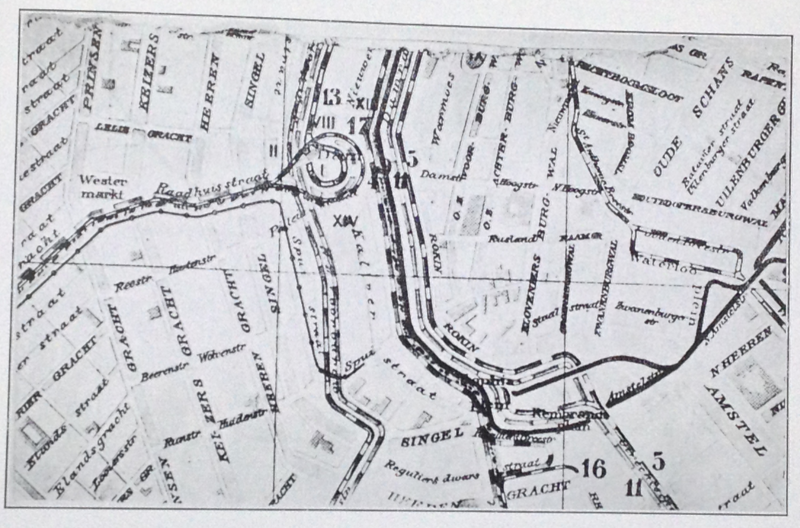 what about finding old Maps of Amsterdam(When im Right) from the same Year, erase all Points, Names Rivers, etc what match in both maps and check what is left. If u cant find the Needle, make the Haystack smaller! I trieded to find old Maps, but all are behind a Paywall. The publisher might not have considered, nor cared, that the original cipher drawing be adequately represented in the manual. The publishers technical method of photographing, copying, printing might have lost the necessary detail, I mean, to read it… and the publisher might not have cared, as being able for the reader to see it properly may have not been their intent. Continuing with that thought… as others have surmised, I would suggest that the form of Morse code is in the borders which are “ladder-like”. Perhaps, as one possible, on the original the little ladder “rungs” don’t meet the border for dot represenation; or perhaps some are thicker, or thinner, to make the distinction. Perhaps, even, the original cipher drawing is in color, with different colors denoting “dots” and “dashes”. It was great you managed to see and photograph the original manual… but if my guess is correct, it would be the original German cipher illustration which must be seen, to adequately descern the code’s subtleties, in order to know how it was used. Regarding the map, a solution has already been posted here. I could reproduce the reading of “llesfertig” and a few more fragments, at that time. Thanks for the hint. 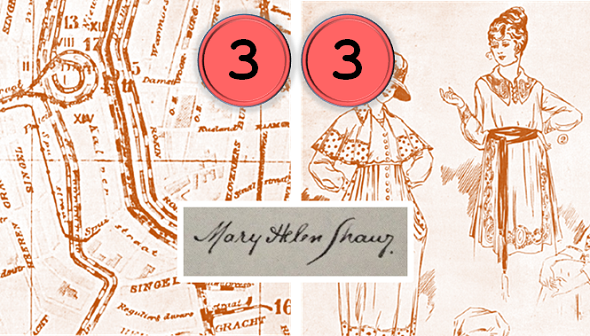 The comment says: “… below the dashed line running along raadhuisstraat, there are little pen marks, single strokes for dots, small filled boxes for dashes. Starting near keizersgracht eastwards (or should this be hubward in this particular city) i can make out ‘aathut’, which, when rotated 11 positions forward, gives ‘llesfe’, which could well be part of ‘alles fertig’ for ‘everything is ready’. All this makes sense. However, it is difficult to read the whole message. Thank you very much. This makes sense. 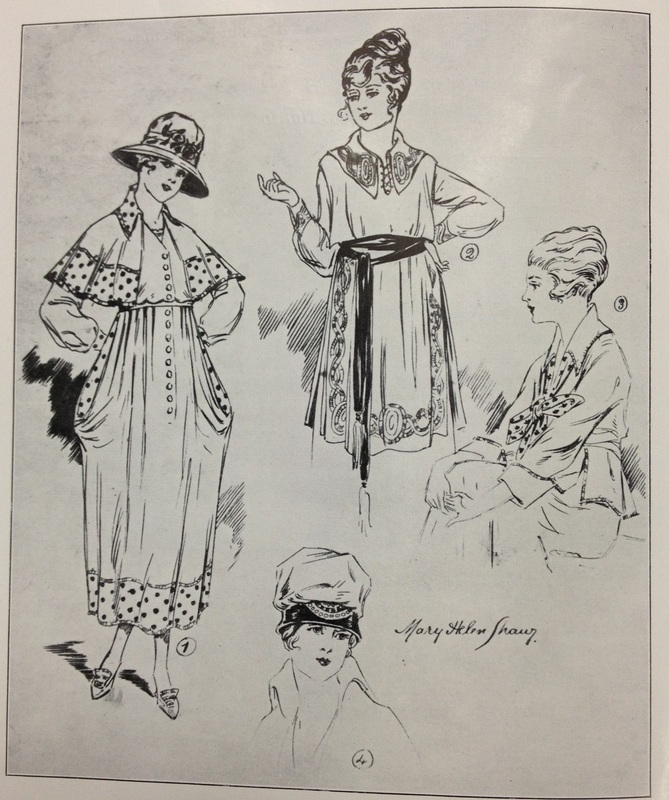 The fashion drawings are interesting. I dont think that the code is hidden in the dots, but the lines in the bordure. Every Model, except for #4 has these bordures in one or another form. Unfortunately they are very small, I think it may be something like two lines representing a dot and three a line. When I look at the Mary Helen Shaw pic, things like vrill, hair, samson, come to mind….Not to mention the ending sounds in the name mentioned is eerie of a horse sound, stuck on repeat…. Mythical ideas aside, the OBvious thing here is when you flip the graphic you see a man with a hand over his eye, under the 3 labeled image. The amazing thing here though beyond that, and all the layered images, symbologies, etc….you are given again…obvious clues in the image to….”Wall-eye” certain spots *Layer* them in such a way as to create new images….For instance you would walleye….the circled 3, so the 3 inside the circle line up in the middle of the Bow-tie looking thing in the chair-sitting lap. Amazingly though you can wall-eye MANY MANY different positions to get MANY combinations….I think I even saw one with a yong looking woman on a beach laying down and scandaly clad, winking perhaps even. The part I forgot to mention which is the real question people might think to ask…..after finding so many possible combinations of wall-eye’ing different positions to make many layered images…..is…how was this accomplished so perfectly? 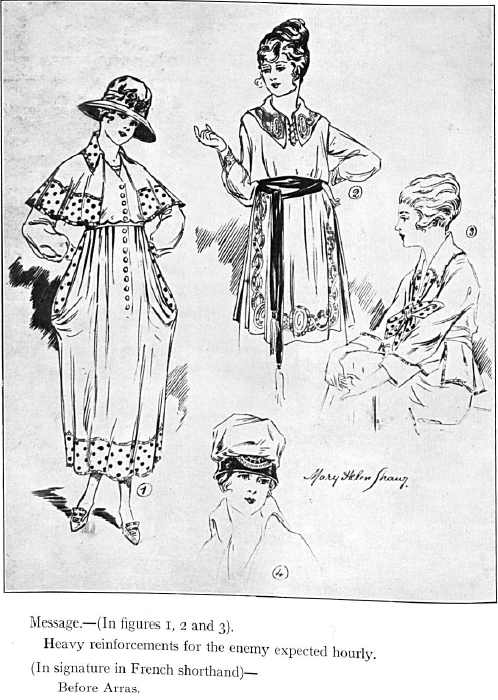 Even today you’d be hard pressed using computer aide to make more than a few different layered points in a single image before losing integrity, and that’s using a digital system, this was apparently hand drawn, also notice many things have been removed, earrings, points on hat…etc. 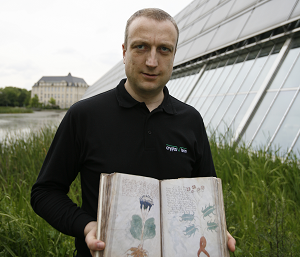 Similar to after seeing the voynich manuscript one should wonder how it was drawn with no mistakes as if the hand/pen never left/touched the medium it was written upon.